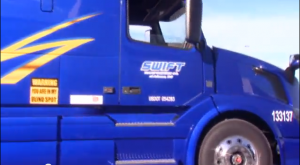 Cleveland, OH – A new video featuring behind-the-scenes fleet facility repair work at SWIFT Transportation is now available on the Genesis® Product Website: http://genesis.sherwin-automotive.com/home/. Entitled “You want a premium basecoat designed for superior performance?” the new video showcases an interview with SWIFT’s maintenance director and shows actual repair applications featuring the Genesis® G4 system by Sherwin-Williams Automotive Finishes. “Our Genesis® primers and topcoats offer outstanding performance and appearance. These products deliver productivity and profitability and are a complete solution for their fleet and manufacturing needs,” says Dan Szczepanik, Sherwin-Williams OE/Commercial Products Manager. Genesis® G4 Basecoat System is formulated for outstanding performance to meet rigourous OEM standards and enhanced color match capability, including OEM colors for fleets, trucks, specialty vehicles and manufacturing equipment. It is a premium-quality, two-component, 3.5 lbs. per gallon VOC-compliant urethane basecoat that delivers excellent appearance with durability and superior flexibility. It features fast dry times resulting in more rapid paint production for painters to complete more vehicles.